Heisman candidates in the SEC next season, top three , in alphabetical order, would be Arkansas running back Knile Davis, South Carolina running back Marcus Lattimore and Alabama running back Trent Richardson. 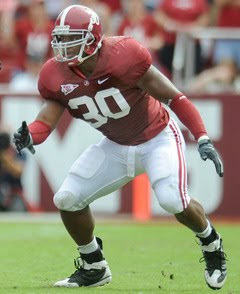 Dont'a Hightower is fast, furious and ready to lead the Crimson Tide defense the way many always believed he would. 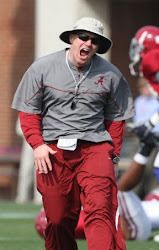 - Dial will have three calendar years to play two seasons at Alabama. Introducing - Jesse Williams, a 6'4", 330-pound monster defensive lineman from Brisbane, Australia. He is a transfer from Arizona Western College and was ranked No. 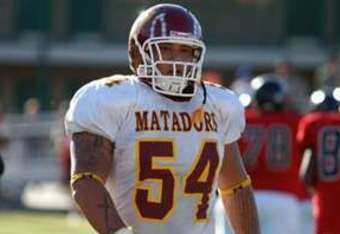 2 in the Rivals.com JUCO Top 50. 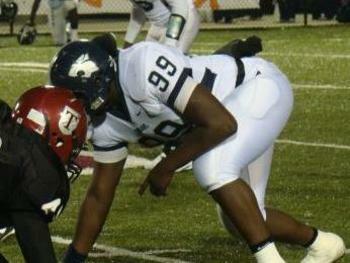 - Williams' has emerged as an ideal 3-4 two-gap nose who can occupy blockers and clog up running lanes in the SEC. - Williams' brute strength, quickness to jump on top of blockers at the snap, upper body strength, anchor strength, shed ability and range will allow him to seamlessly fit and transition into the defense. Trent is Ready to Roll !! - Tore ligaments in his foot in the opener against San Jose State. - In the LSU game, Richardson tore his abdominal muscle and also sprained the MCL. 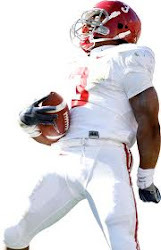 - Trent averaged 6.2 yards per carry, 63.6 YPG and led all Alabama running backs with 23 catches. - Trent finished 2nd in the SEC in all-purpose yards, averaging 145.4 YPG. - LT: ??? Aaron Douglas ??? To me the most interesting battle this spring will be on the O-Line. There are some "monsters" going after starting roles on Bama's O-Line ..
Alabama senior Robby Green was not at practice Monday after he was suspended by the team for violating team rules and policies, Saban said. QB's - I believe it's AJ's job to loose, but by no means can you count out Phillip Sims, Phillip Ely or Blake Sims. The Crimson Tide opens the first of 15 spring practices today at 3:30 p.m. in Tuscaloosa. Other stdiums in the SEC? QB? Who will it be? Redshirt sophomore A.J. McCarron, redshirt freshman Phillip Sims or true freshman Phillip Ely? RB. Trent Richardson begins his Heisman Run. Who's gonna be #2? Eddie Lacy? Can Eddie get past his fumble issues? True freshman Dee Hart? OL: Jesse Williams (6'4" @ 330LBs) & Aaron Douglas (6'6" @ 280LB) JUCO Xfers.. OL will be stacked by fall. Defense will be stout this year. CJ Mosley, Dont'a Hightower, Mark Barron, Dre Kirkpatrick, Courtney Upshaw and more... Don't forget that True Freshman Trey DePriest will be in the mix too. "We plan on him starting against Alabama. He actually played three quarters pretty well then obviously the two fumbles were pretty bad plays. Can he stop fumbling? We're going to give him a chance to stop fumbling. He hasn't thrown a lot of picks this year so other than the fumbles, he's played pretty decently." -- South Carolina coach Steve Spurrier on quarterback Stephen Garcia, following practice Tuesday night. 1. Denard Robinson, Michigan QB: Threw for 277 yards and ran for 217 more (494 total) in a 42-35 shootout against Indiana. Also accounted for five touchdowns. Last week: Ranked 1st. 2. Cam Newton, Auburn QB: Spread his wings against Louisiana-Monroe, passing for 245 yards and three TDs in a 52-3 beatdown. Last week: Ranked 3rd. 3A. Mark Ingram, Alabama RB: Ran for 47 yards on 12 carries, cracking the end zone twice, and added 19 yards in receptions against Florida. Last week: Ranked 2nd. 3B. 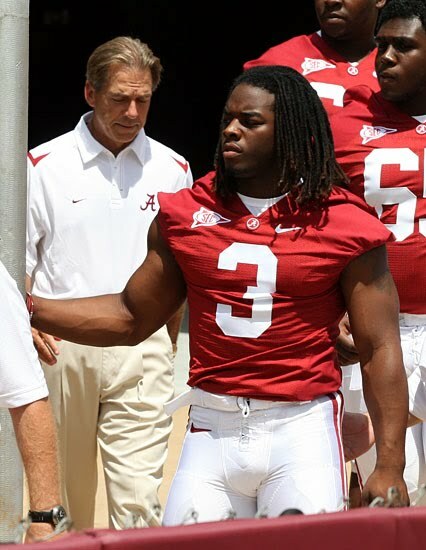 Trent Richardson, Alabama RB: Ran for 63 yards on 10 carries in the 31-6 victory against Florida. Last week: Not ranked. 4. Kellen Moore, Boise State QB: Threw for 196 yards and three TDs in a cameo against New Mexico State amid a 59-0 shellacking. Last week: Ranked 4th. 5. Terrelle Pryor, Ohio State QB: Zigged and zagged for 104 rushing yards and passed for 76 in a lackluster, 24-13 victory against Illinois that included an injury scare. Last week: Ranked 5th. 1. Alabama: The scary part isn’t that Alabama defeated Florida 31-6. The scary part is that the Crimson Tide (5-0, 2-0) made it look so easy. When the game was 31-3, Alabama shut it down to run some clock, or the Crimson Tide could have easily scored in the 40s. This is a physical team, a team that can beat you a number of different ways offensively and a team that’s only going to get better on defense. Alabama is a 7-point favorite. The Game of the Century III comes down to this: Can Florida stop Mark Ingram and Trent Richardson while testing Alabama's revamped secondary? Florida -- Demps (ankle), probable; DTs Lawrence Marsh (forearm gash) and Brandon Antwine (shoulder), probable; K Caleb Sturgis (back), out; WR Chris Rainey (suspended), out. Alabama -- Dareus (ankle), probable.